I’m sure my child is not the first one your child has hit. In fact, you’re probably aware that your child is infamous for being a hitter. I’m sure that sometimes you just want to wish the hitting away — as so does any mother that has a child with a recurring, undesirable character trait. But, I would like you to consider the other moms and children who are victims of your child’s constant physical aggression. From one mom to another, I can honestly say that sometimes the parenting journey gets confusing. Everyone has an opinion, and honestly, there are some very popular parenting solutions and opinions today that only hurt families instead of help them. I constantly get emails from moms who feel their kids are out of control. So, mom of the child who hits, you are definitely not alone. However, there is a common thread among the moms of children who hit. They have been listening to the media and parenting magazines and have at one time or another viewed their child as a helpless victim. I guess it’s hard not to, if so many “experts” on parenting are saying so. But, let’s take a minute and really consider the logic of that specific thinking. In the past four years I have seen an influx of “experts” telling moms that if their child has outbursts of aggression, they simply cannot control it; that they themselves are the real victims. But, what about the person that is the target of the aggression? Are you telling me the child who is quietly playing blocks and gets smacked on the head with a book isn’t the victim — but the hitter is? Now, how does that make sense? Umm…just doesn’t click with me. And I hope it doesn’t with you either. What’s scary is that many articles are written to evoke empathy towards a child who dares to hit his parents. And for me, that is waaaaay over the line. If your child hits you, something needs to change — and soon! Whatever the case, please consider the other side of the story. Let me start with a very typical scenario that I have seen played out before my eyes — at least thirty times. A child comes in, obeys the teacher, shares the toys and even helps during clean-up time. While that child is innocently playing with a toy, the aggressive child comes and snatches the toy out of his hands. If the quiet child protests, the aggressive child shoves the reserved child down. And how do many moms of a child who hits respond? And, that’s that. The end. However, only a few minutes later and the aggressive child goes after yet another kid. This time he doesn’t like something the child does, so he punches him in the stomach — hard. What’s the mom or dad’s response? “Now, Ethan….I said don’t do that!” Again, it’s not a commanding voice, it’s a pleading one. Meanwhile, other moms or teachers try to comfort the child that was the chosen object of the child who hits aggression. But tomorrow, it will be yet another child. Please don’t lose me here, because I am just trying to help you see the other side of things. I know you suffer when your child is constantly showing aggression towards others — especially when your child shows aggression towards you. And, that is why I am writing this letter to you. So that maybe somewhere in this article you will find some help for your confusing journey. Other advice hasn’t helped, has it? Giving distractions when you see your child become angry just isn’t cutting it, is it? Hugging your child until they calm down still doesn’t stop the continual outbursts, does it? This is exactly why I feel urged to offer some help — a little guidance from a mom who has had to deal with some very angry, explosive children. But I want to ask you one more thing. Try to look at this situation from an unbiased point of view. Try to picture the child who constantly hits and harms other children as a stranger’s child, and not your own. Sometimes that helps us see our child’s behavior more clearly — if we can just remove our mommy glasses for a moment or two. Now, I will completely agree that children have all types of personalities. And I will also agree that some people are more sensitive to sensory overload — in fact, I consider myself one of those people. Even though I am an adult, when things get too loud, too bright or too hot, I will develop headaches, migraines, heart palpitations, rapid heart rates and sometimes have shortness of breath. I also tend to be really snappy after I eat carbohydrates such as rice, corn, pasta or anything with flour. But, does that mean it’s OK for me to lash out at strangers, friends or my family? Is it OK for me to yell at my kids because I am having a sensory overload? You see, as moms, we have to use our position as leaders in our children’s lives to teach them what is acceptable and unacceptable behavior — even if they’re feeling angry, jealous, unwell or are experiencing sensory overload. You know what? The entire world does not turn off the lights, cool down or become serene and quiet just because I am feeling overwhelmed with all the sights and sounds. I wish it did, but it just doesn’t happen. It is my responsibility to deal with the effects of the extremes on my senses and also to avoid a sensory overload as much as possible. The same goes for the child who is continually aggressive towards others. He has to learn to control his anger — and who will teach him that? You, dear mom, you will be the one to do it — whether you want to or not. If when your child hits my kid or another kid and you do absolutely nothing about it except remove him from the situation or plead with him not to do it again — guess what? You are teaching him that there are no consequences for hurting others. It is likely that your child will grow up believing that there are no serious repercussions for harming another human being without a cause. And that, dear mom, is a dangerous lie to believe. And you know what else? Without consequences for violent behavior towards others and parents, it will continue. It will happen again…and again…and again. So, I ask you, dear mom with the child who hits, please, please deal with your child. Please do not stand by and let it happen over and over again. And just a side note, ignoring the behavior is not dealing with it. As your child gets older, the anger and frustration will not just disappear. It may seem that way because it only comes out in more provoked situations, but your child will suffer all the way into adulthood with controlling anger if you do not deal with it now. Because your child is excused for the violent behavior, my kids and other kids cannot enjoy a play date together with their friends, unless your child is not present. A fun day at the park is turned into a nightmare when your child shoves two kids down the slide, pushes three kids out of the swings and screams at you in anger when you call him down. 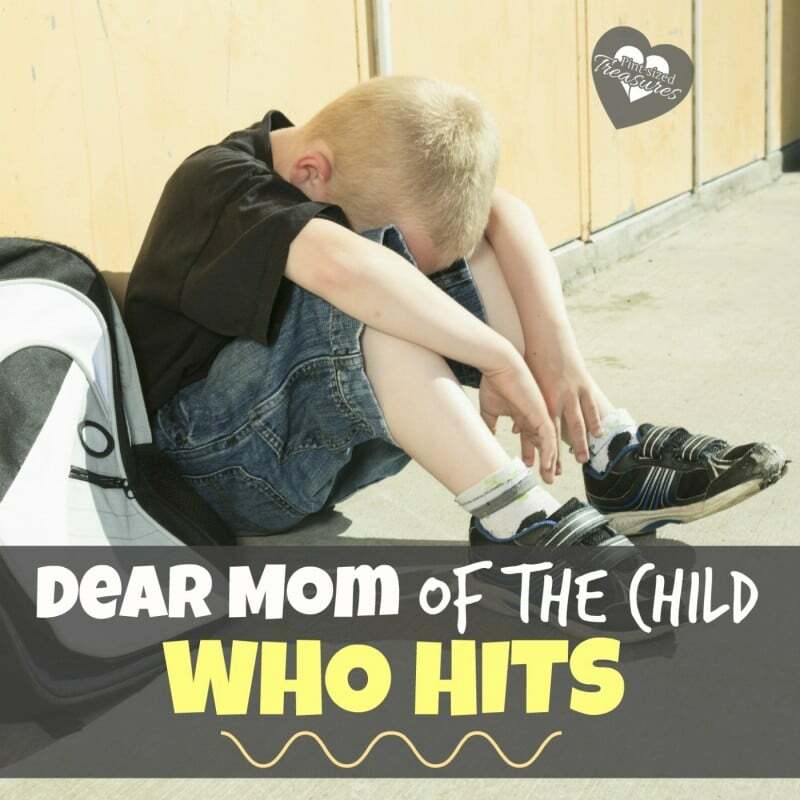 What can you do as a mom of a child who hits? Though my kids have never been “the hitter” I have had to deal with a few when they were in my care. One was a family member and the other child was at church. I also had to deal with an entire class of biters where everyday greeted me with crying, screaming and horrible bite marks left on the children when they were about to return home. All those outbursts of anger had to be stopped. When I made an aggressive child sit, I sat right beside him or her to ensure they did not get up. I did not go off and start cleaning up or engage in a conversation with a friend. Although those are perfectly awesome things to do, ensuring a child follows through with a consequence needs your complete attention. And trust me, I know it’s oh-so-easy to become distracted or think that it’s OK if I let the aggressive behavior slide this time. But with consistent consequences, the aggressive children learned quickly that hurting others was not allowed — ever. Every single one of those children finally quit showing aggression when they were under my care. In fact, their parents thanked me for how happy they were when they showed up. They even told me they were happier at home! And another thing? I never showed anger or frustration towards those children. I just firmly let them know that aggression is never, ever tolerated. And when they were behaving, I showered them with kindness and held no grudges or resentment for their past aggressive behavior. I also included them in fun activities and rewarded them for good behavior. And just for the record, my kids have shown aggression a few times — throwing blocks across the room in anger, hitting a family member, kicking an adult. Those things all happened — but my kids never became repeated offenders. Why? Because the outbursts of aggression were not ignored and they were dealt with every single time. They learned that spilling a cup of milk on the table was not a big deal, but hurting another person? That was never, ever allowed. 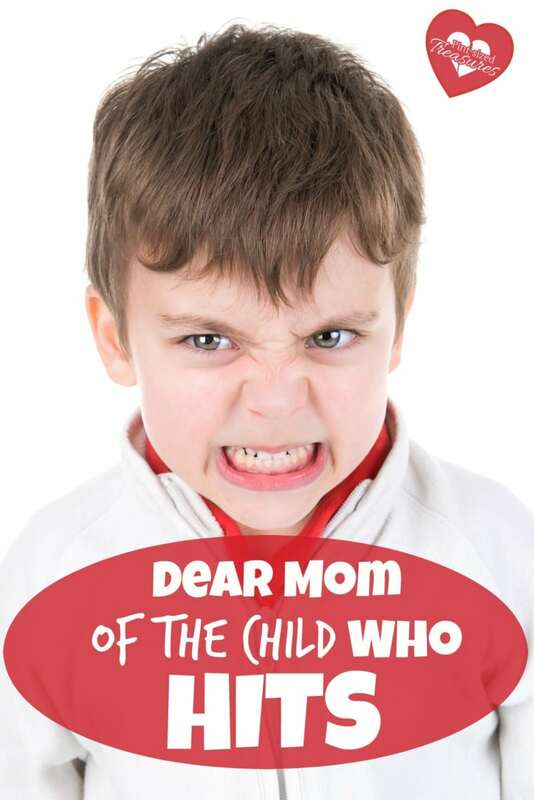 So dear mom, for your child’s future’s sake — and for the true victims of your child’s aggression — please deal with your child’s outbursts of anger and aggression — every single time. It will take time, consistency and loads of patience, but soon you’ll see the reward of your hard work — a child who is no longer a hitter! I truly, truly hope you can find real answers and real help in this post!